On this special Tuesday Playoff edition of Around the Brackets, we’ll recap first-round playoff action from Class 3A. Nemaha Central 59, Pleasant Ridge 26 – Nemaha Central rolled Pleasant Ridge 61-6 to open the playoffs last season, and on Tuesday night the Thunder cruised to a 59-26 victory. The Thunder led 14-0 after the first quarter and 34-6 at halftime. The Rams scored out of the locker room to cut the lead to 34-12, but Nemaha Central added two touchdowns to lead 47-12 after three quarters. The teams traded touchdowns in the fourth quarter resulting in the Thunder’s final 33-point margin. Silver Lake 29, Mission Valley 7 – Silver Lake won a playoff opener over Mission Valley for the second consecutive season. The Eagles won 29-7 after blanking the Vikings 50-0 last year. Mission Valley got on the board first as Blake Roberts busted loose for a long touchdown run on the first play. Mason Jones then added a couple of touchdown runs as the Eagles built a 21-7 first-quarter lead. The score remained the same until the third quarter when Jones added his third touchdown as part of his 197-yard night. Wellsville 48, Humboldt 0 – Wellsville cruised to its eighth consecutive first-round playoff victory as the Eagles shut out Humboldt, 48-0. After scoring on its first drive, the Eagle defense got on the board with an interception for a touchdown. On the ensuing kickoff, Humboldt fumbled setting up another Wellsville score and a 20-0 lead. The lead would balloon to 34-0 at halftime. Wellsville’s last first-round playoff loss came back in the 2008 season to Central Heights. Galena 66, Neodesha 14 – Galena raced out to a 58-7 halftime lead over Neodesha and cruised to their fourth-consecutive victory with a running clock. Sophomore Logan Henderson carried five times for 112 yards and three touchdowns in the win. The Helton brothers, Joseph and Michael, each added two scores on the ground. Sabetha 56, Maur Hill-Mount Academy 14 – Sabetha led Maur Hill, 34-7, at halftime and rolled to a 56-14 victory. The Bluejays (9-1) have won at least one playoff game in the last four years. In the last three seasons, Sabetha went 8-3, 7-5 and 9-2. Sabetha has not had double-digit wins in a season since a 10-3 year in ’06. Perry-Lecompton 27, St. Marys 21 – Perry-Lecompton never trailed in winning at St. Marys, 27-21. The Kaws built a 13-0 lead in the second quarter as Dalton Kellum followed his first-quarter touchdown run with a long scoring pass to Colton Mallonee. From there on, every time the Bears would score, Kellum would have the answer. Kellum finished with more than 250 yards rushing in the game and three touchdowns. The playoff victory is Perry-Lecompton’s first since finishing as the Class 4A state runners-up to Holton back in 2008. Osage City 48, Jayhawk-Linn 14 – Osage City won at Mound City for the second consecutive season, beating Jayhawk-Linn, 48-14. While Osage City needed a long touchdown pass late in last year to pull out a 20-14 victory, the Indians led 27-6 at halftime in this one and cruised to their eighth win of the season. Dating back to the 2004 season, Osage City’s best season was the 2009 team that finished 7-4 and lost in the second round of the 3A playoffs to Galena. Caney Valley 55, Cherryvale 22 – After falling to Cherryvale 22-16 back in Week 6, Caney Valley took control early in Tuesday’s playoff rematch in building a 21-0 first-quarter lead. Grant Richey, Cole Ellis, and Trey Richey each rushed for touchdowns in the opening quarter. Six different Bullpups scored on the night and Caney Valley special teams scored twice on punt returns for touchdowns. Grant Richey led the Bullpups with 155 yards on the ground. Cheney 48, Douglass 8 – Cheney led 48-0 with 40 seconds remaining in the third quarter on a three-yard run by Riley Petz. He also opened the scoring with a five-yard run. Then, Micah Grover found Trent Scheer for a 41-yard touchdown pass for a 14-0 lead with 2:23 left in the first quarter. Grover added an 18-yard scoring run and Petz had an eight-yard score for a 28-0 halftime lead. Grover opened the lead to 35-0 with a 50-yard pass to Lakin Petz. The 8-2 Cardinals have won its most games since a 9-2 year in ’06. Cheney had defeated Douglass, 62-12, on the road in Week 4. Marion 54, Halstead 30 – Halstead led Marion, 16-12, at halftime before the Warriors pulled away for a 54-30 victory. Marion opened the second half with an eight-yard scoring run to pull ahead 18-16. Then, Halstead fumbled the kickoff. Marion tacked on a 27-yard scoring pass for a 26-16 advantage. A 59-yard Marion fumble recovery bumped the lead to 32-16 with 4:49 left in the third quarter. The Warriors scored again early in the fourth for a 38-16 advantage. Two consecutive Halstead scores closed the gap to 38-30, but the Warriors pulled away with a Chase Stringer 26-yard run. Marysville 62, Norton 21 – Norton led 7-0 early before Marysville eventually pulled away for a 62-21 victory. Marysville led 24-7 with 5:44 left in the first half. It marks Marysville’s first playoff win since a state runner-up showing in ’09. The Bulldogs had lost to Norton in the first round of the playoffs each of the past two seasons. Norton went 7-3 in the final year under quarterback Jace Ruder, a North Carolina commit, but lost all three contests by at least 40 points. Larned 42, Lakin 6 – The Indians won a playoff game for the second straight year with a 42-6 home victory versus Lakin. Before last year, Larned had not captured a playoff win since 1985. The Indians led 21-6 at halftime and doubled their point total in the second half. 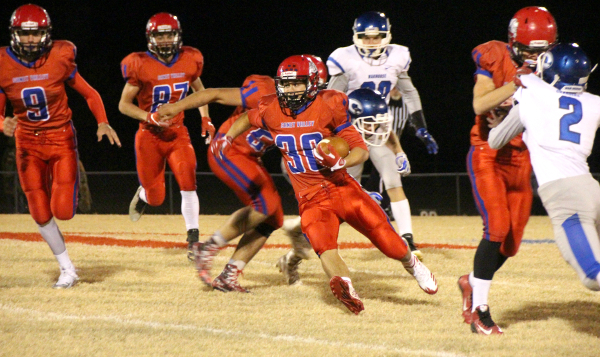 Conway Springs 55, Wichita Independent 6 – After a first-round upset of Cheney, 17-13, in 2015 and a close loss to Garden Plain, 12-7, last season, Wichita Independent was no match for Conway Springs in this year’s first round. Conway Springs led 37-0 after the first quarter and 55-0 at halftime. The Cardinals also defeated Independent, 60-0, back in Week 2. Hesston 47, Hutchinson Trinity 6 – Hesston rolled over Hutchinson Trinity, 47-6. The Swathers led 21-0 in the first quarter and 34-0 with 1:43 to play before halftime. Trinity scored its only touchdown midway through the third quarter. The Swathers finished as Class 3A runner-up last season. Phillipsburg 48, Riley County 13 – Phillipsburg was pushed by Riley County in a first-round matchup last season (49-27) but had no trouble this year. The Panthers led 48-0 with 5:08 left in the third quarter and won easily, 48-13. Phillipsburg built a 34-0 lead midway through the second quarter. Hoisington 47, Cimarron 22 – Hoisington led 21-0 early in the second quarter and enjoyed a big day from senior running back Sean Urban. The Cardinals defeated Cimarron, 47-22, on the road. Hoisington is now 3-0 all-time in the playoffs against the Bluejays with all the victories in the last four years. Cimarron lost in the first round for the fourth straight year and sixth occasion since 2010. Urban, who ran for more than 200 yards, increased the Hoisington lead to 47-8 with a 68-yard score.